The M-Series+ wedges feature CNC milled square Micro Grooves and a CNC milled hitting surface. All of the M-Series+ wedges are identical in shape and blade profile. However, understanding that turf and sand conditions often dictate the type of wedge that should be played, there are 12 different wedges in the M-Series+ Wedge System that allow the player to mix and match the sole width and loft that best fits their needs. The M-Series+ Tour wedges have a sole width of .900”, the M-Series+ Mid wedges have a sole width of 1.05” and the M-Series+ Wide wedges have a 1.20” sole width. Basically, the sole widths of the M-Series+ Wedges increase as the wedge lofts increase to aid in hitting the more difficult to use higher lofted wedges. 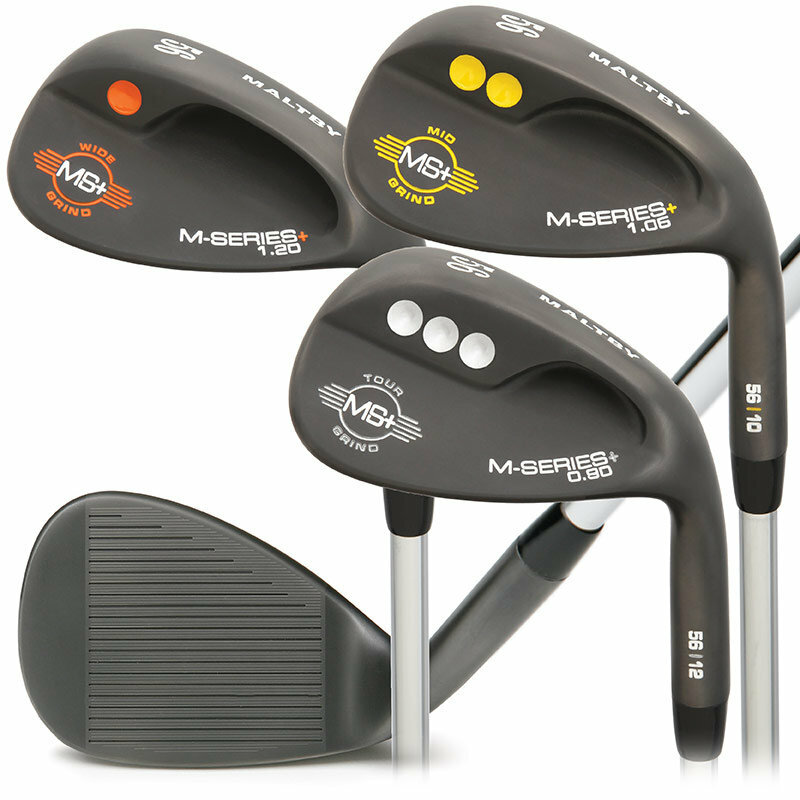 However, the effective bounce angles of all the M-Series+ Wedges are relatively similar which allows the player to simply switch sole widths when playing under different course conditions without sacrificing the look and feel of the wedge they have devoted practice time to and have become familiar with. The M-Series+ wedge lofts overlap to allow a player to pick the best sole width based on the course conditions they play or fit their skill level. For example: A M-Series+ 56 degree wedge is available in all three sole width options, Tour (for firmer sand/turf conditions and or highly skilled players), Mid (for average sand/turf conditions and or low to mid handicap golfers), and Wide (for loose sand and plush turf conditions and or mid to high handicap golfers). The ideal wedge set make up for most golfers regardless of skill level should include at least one moderately wide soled wedge in their golf bag. The M-Series+ Wedge Series solves this problem without the need to carry 2 or 3 different brands with different head shapes and effective bounce angles.